Home Bistro chef prepared meals / dinners... We create great recipes - everything from soups and appetizers to complete meals and desserts. Then, using only the finest ingredients, we prepare everything, with skill, know-how, and artistry, just for you. We do all the time-consuming things. We shop and we chop. We mix, blend, and sauté. We grill the steaks, roast the lamb, poach the salmon. All you need to do is follow the simple instructions to heat and serve our meals in about 10 minutes. It's that easy. 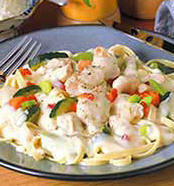 Sautéed cuts of boneless chicken breast and fettuccine pasta in a rich Alfredo sauce prepared with real cream and imported Parmesan cheese, and accented with a medley of garden vegetables. 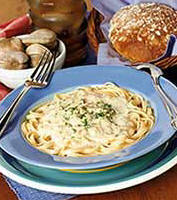 Tender chopped clams and a delightful cream sauce made with garlic, white wine, anchovies and a touch of red pepper top delicate linguine pasta. Linguine pasta and plump shrimp in our own pesto sauce made with garlic and basil complemented by a blend of white and wild mushrooms. 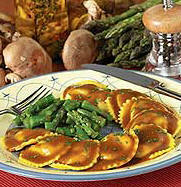 An assortment of wild mushrooms blended with creamy ricotta cheese and wrapped in ravioli pasta topped with a deep brown Marsala wine sauce and served with asparagus cuts. 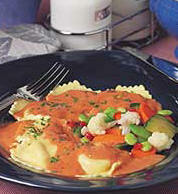 Ravioli stuffed with shrimp and garlic in a classic, creamy vodka sauce made with tomatoes, shallots, and black and crushed red pepper served with a medley of zucchini, carrots, Italian beans, lima beans, cauliflower, and red pepper. 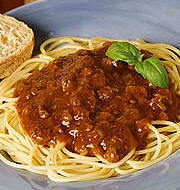 Semolina pasta in a hearty Bolognese meat sauce flavored with red wine, onion, celery, and olive oil. 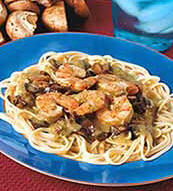 © Copyright 1995 - 2006 Gourmet Food Appetizers.. All Rights Reserved.